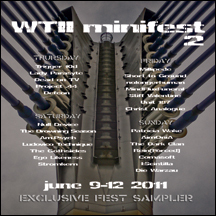 This is a limited edition (200 copies) compilation CD sold at WTII Minifest 2 June 9-12. This is a 16 track release that features several artist from the 4 day fest remixing other artist from the fest. All remixes are exclusive and include remixes from Stiff Valentine, am.psych, Rein[Forced], Trigger 10d, The Gothsicles, Ego Likeness and more. CD is sold in a slimline jewel case and supplies are extremely limited.